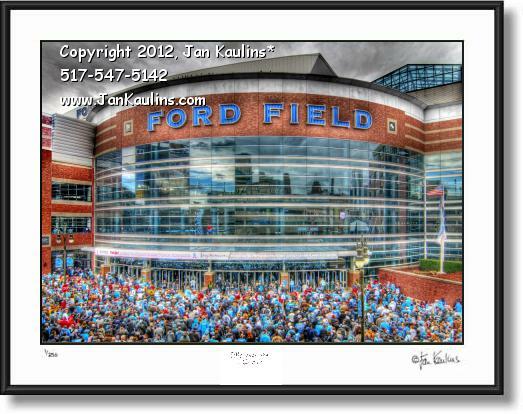 Detroit Lions photo prints for sale and Detroit Pistons Photo Art Print Photograph Gallery of Detroit Michigan - (Detroit Lions and Detroit Pistons Photography picture prints photographs for sale: The City of Detroit Photo Art Print Gallery): These contemporary color photographs of Detroit Lions games and Detroit Lions Ford Field, Pontiac Silverdome football stadium, and The Detroit Pistons at The Palace of Auburn Hills are made from original black and white photographs that have been hand colored by nationally recognized artist and photographer Jan Kaulins. 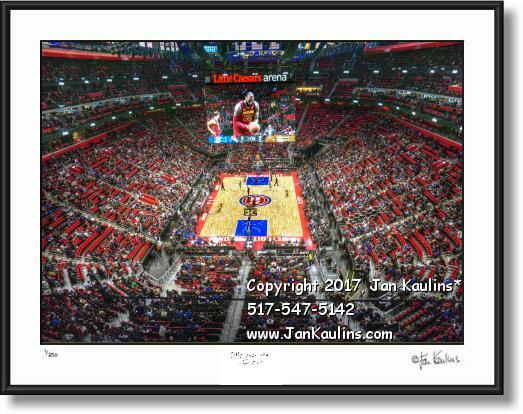 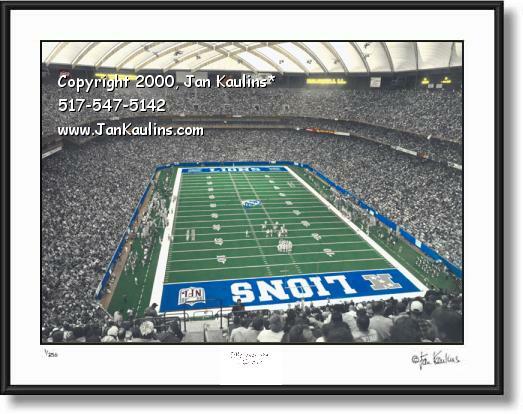 The Detroit Lions and Detroit Pistons Photo Gallery pictures include photos ranging from a wide angle, now historic, photo of The Detroit Lions playing inside a sold out Pontiac Silverdome, where the Detroit Lions played football from 1975 to 2001. 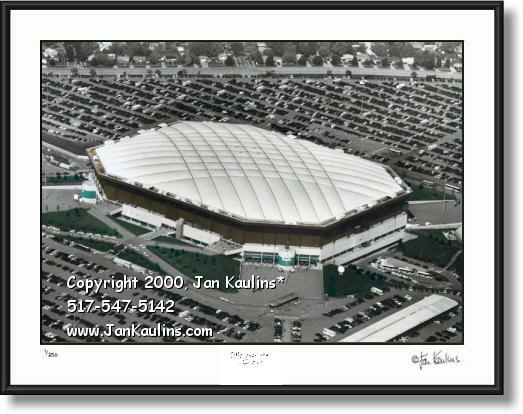 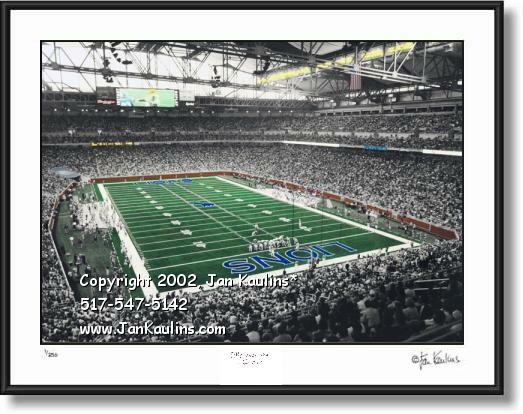 There is also an aerial Pontiac Silverdome photo print of The Pontiac Silverdome. 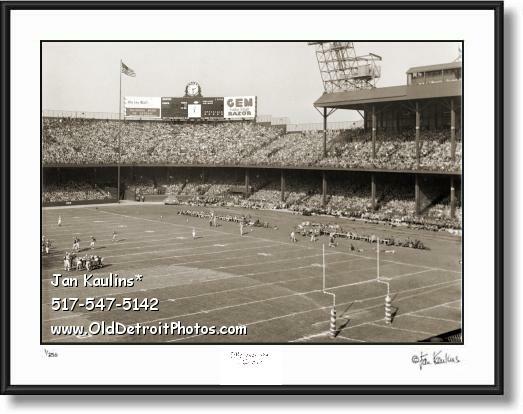 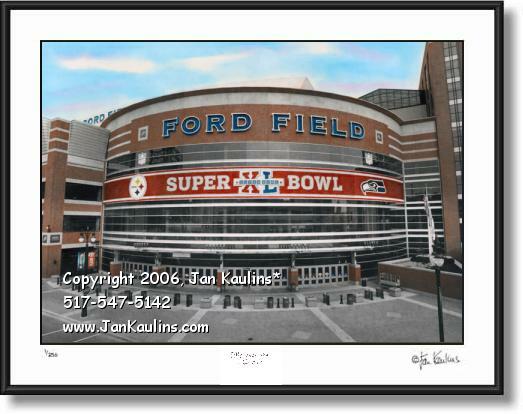 The Detroit Photography Photo Gallery also has more recent photographs that picture historic 'Opening Day at Ford Field', the very first Official Inaugural Game played at the new home of The Detroit Lions, Ford Field, on September 22, 2002. 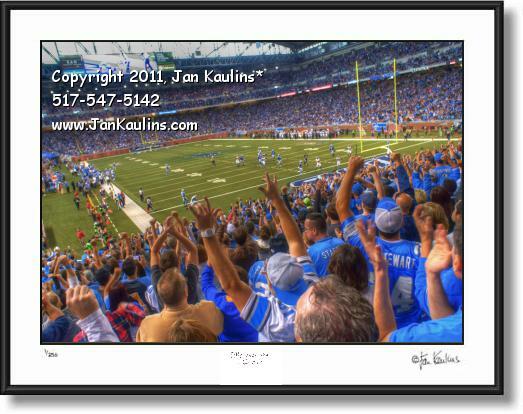 Included in the Detroit Lions Photo Gallery is an excellent Inaugural Game action photo of rookie Quarterback Joey Harrington throwing a pass. 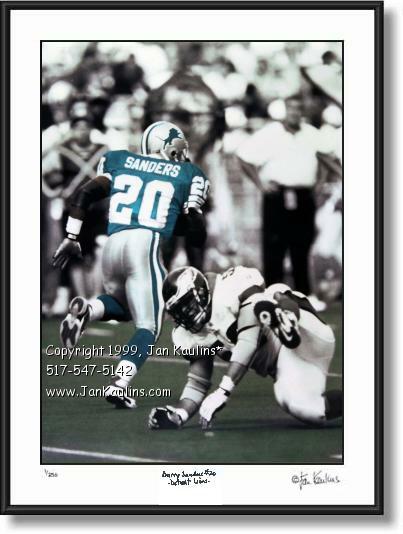 The Detroit Lions and Detroit Pistons Photo Gallery also includes a historic picture of the huge mural of legendary Detroit Lions Barry Sanders. 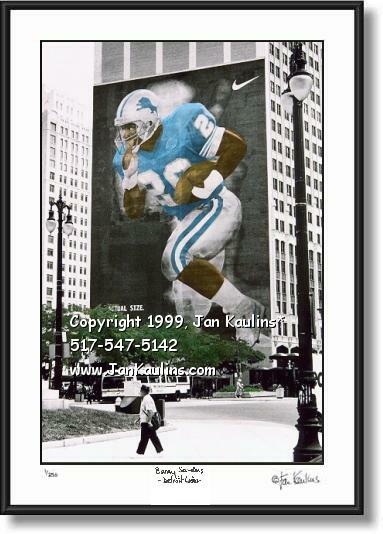 This Detroit Lions photo shows where, for many years, the Barry Sanders mural stood, painted on the side of The Cadillac Towers Building in Cadillac Square, downtown in The City of Detroit Michigan. 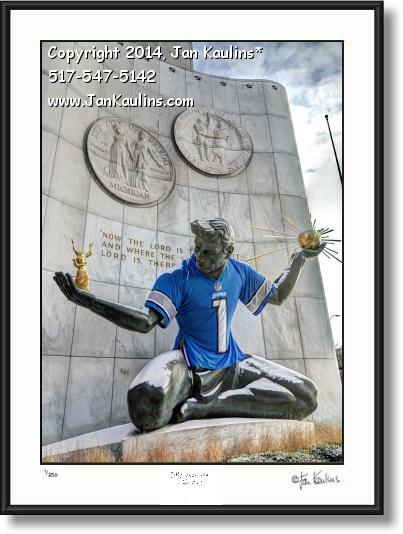 The Detroit Lions are back in Detroit, playing football in the city for which they were named. 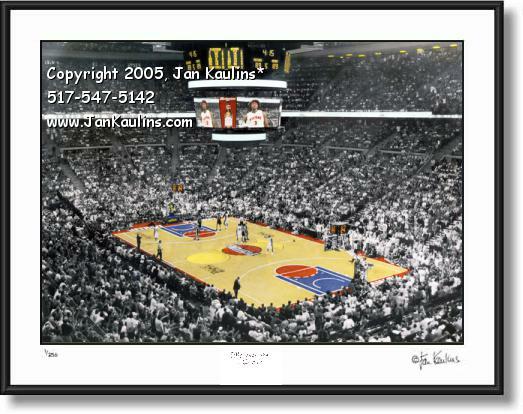 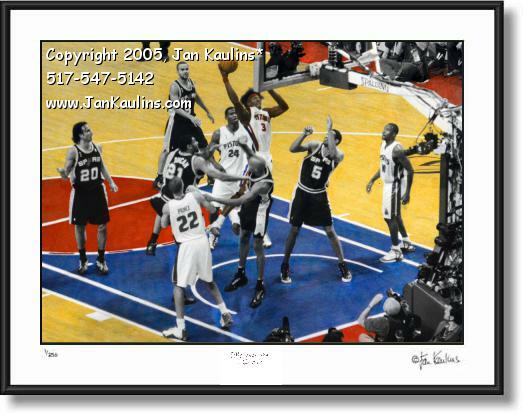 The wide angle game photos of The Detroit Pistons were taken inside The Palace of Auburn Hills during the 2005 NBA FINALS against The San Antonio Spurs. 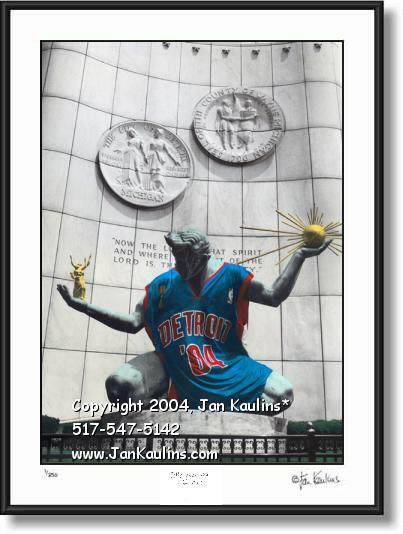 There is also a picture photo of The Spirit of Detroit statue in downtown Detroit wearing The Detroit Pistons jersey from 2004 and 2005. 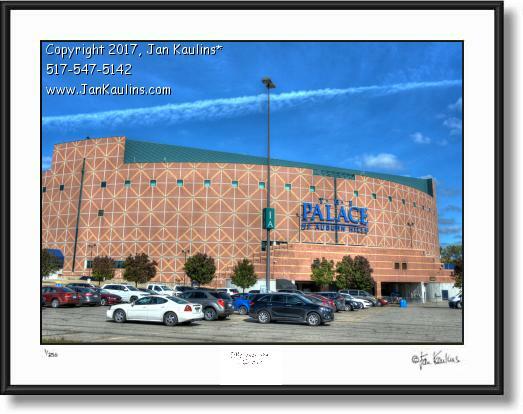 BE SURE TO SEE THE MANY OTHER DETROIT PHOTOS AVAILABLE ON THIS WEBSITE AT THE DETROIT PHOTO GALLERY, INCLUDING LANDMARKS, BUILDINGS, BELLE ISLE, DETROIT AERIAL PHOTOS, DETROIT SKYLINE PHOTOGRAPHS AND MANY OTHER DETROIT PHOTOS BY CLICKING THE "HOME - Return to ALL Galleries'' LINK NEAR THE BOTTOM OF THE DETROIT PHOTOS ON THIS PAGE OR CLICKING ON THE 'Back To Detroit Photo Gallery...' LINK AT THE TOP OF THIS PAGE.